Can new Smart car make the UK love electric? Smart car was in the UK this week to show off the latest version of its electric car – the BRABUS electric drive. Although just a concept at the moment, the car is a promising move for Mercedes-Benz, the makers of Smart, as it promises to bring a bit of spark to Britain's snail-paced electric car industry. Positioning itself as a 'sports car' is more tongue-in-cheek than fact – although it does look the business with sports suspension and 'Monoblock VII' alloy wheels in a five double-spoke design – with Smart adding an artificially produced running sound to the car to replace the steady hum of the electric engine. Interestingly, the makers have gone for a 'race car engine' sound but this can be replaced by virtually any sound in due course. Of course it's a gimmick, but the electric car needs all the help it can get to grab headlines in the UK. TechRadar sat down with Smart's Product Manager for Europe, Pitt Moos to discuss the company's love for the electric car and whether it was the right environment, with car manufacturers shutting here, there and everywhere, to unleash environmentally friendly automobiles into the market. "Everyone laughed at the idea of a Smart Car when it first was announced that we wanted to do an ecological car. No one would touch us," explains Moos about Smart's humble beginnings 15 years ago. "Then one of the oldest car manufacturers, and in some ways the most conservative, said yes to it." That manufacturer was Mercedes-Benz, who announced a joint venture with the Swatch group (pre-Smart) in 1994. It wasn't until late 1998 that the first Smart was launched, the Smart City Coupé, and since then the company has grown from strength to strength. But this hasn't been without some major set-backs on the way. "We celebrated the millionth Smart car sale in September, which is great but we're not going to turn round and say we're a success story," says Moos rather candidly. "We've been through hell but are starting to get towards heaven. For some years it looked likely we were going to get the axe. The workforce was cut back in 2005 from 1,500 to 600, but everyone got jobs in the end and the passion from the workers was still there." And it's this enthusiasm that Moos believes has made Smart what it is today: "There's a lot of passion at Smart, and this brings a culture that doesn't always look to the rationale. "Sure, people either love or hate the cars but for us that is a great thing, as you can discard the haters straight away and look to the fanbase and cater to their needs." And what a fanbase Smart has at the moment. The Smart club – for owners of Smart cars – is the UK's second largest 'single marque' car club, with just Mini enthusiasts pipping Smart users to the number one spot. This is a point that Moos re-iterates: "Our members club is one of the biggest of its type in the world. This culture perpetuates into our car manufacturing, and the Smart ED has come out of that culture." 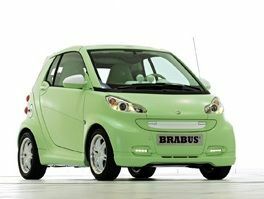 The latest incarnation of the Smart electric car – the BRABUS – could be a game-changer in the electric car world. With the UK government looking to reduce carbon emissions by 80 per cent in 2050, everyone has to seriously think about the way they can reduce their carbon footprint, and electric cars seem a logical step towards this. There are limitations with the electric car that Smart knows only too well, but they do a pretty good job of turning the negatives into positives. Throw the accusation at them that electric cars can only go 70 miles maximum on a single charge, and they reply that 75% of all compact cars are used for travelling to work or shopping on a daily basis.